Most university graduates look back fondly on professors who mentored them or worked on research with them or who helped them discover what they are good at. For international students, a strong student-faculty relationship is vital to their success in what can be a new and sometimes challenging culture. 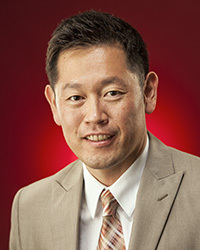 Gi-Yong (Win) Koo was chosen to receive the College of Education and Health Professions Young Alumni Award this year. He reflected on the support University of Arkansas faculty members gave him while he was earning a Doctor of Education degree in recreation and sport management with an emphasis in sport marketing and statistics, which he received in 2013. Koo went from a position as a senior graduate teaching assistant during his doctoral program at the U of A to his first faculty position at Troy University in Alabama. He coordinates the sport management doctoral program inaugurated in the fall of 2015. One of his students was the first graduate in Troy’s history to receive a doctor of philosophy degree. Koo teaches statistics and sport marketing, two areas he is passionate about. He also conducts research about sport marketing and sport consumer behavior. While at the U of A, Steve Dittmore, an associate professor of recreation and sport management, served as his faculty adviser. They worked on research projects together. Dittmore said he enjoyed working with Koo. Because Koo also focused on statistics in his doctoral work, he found a mentor and friend in Wen-Juo Lo, an associate professor of educational statistics and research methods, which is also in the College of Education and Health Professions. Lo, a native of Taiwan, was an important person in his study of statistics, Koo said, as well as his adjustment to life in Fayetteville. The Department of Health, Human Performance and Recreation prepared him well for the work he is doing now, Koo said. He has published 33 articles in peer-reviewed research journals and made more than 70 international and national presentations. And, he has globally collaborated with faculty members at other universities. While at the U of A, Koo received the Luther W. and Edna L. Estelle Scholarship, the Troy Hendricks Scholarship and the NCAA Graduate Student Research Grant, and he was named the Doctoral Student of the Year from the Department of Health, Human Performance and Recreation.